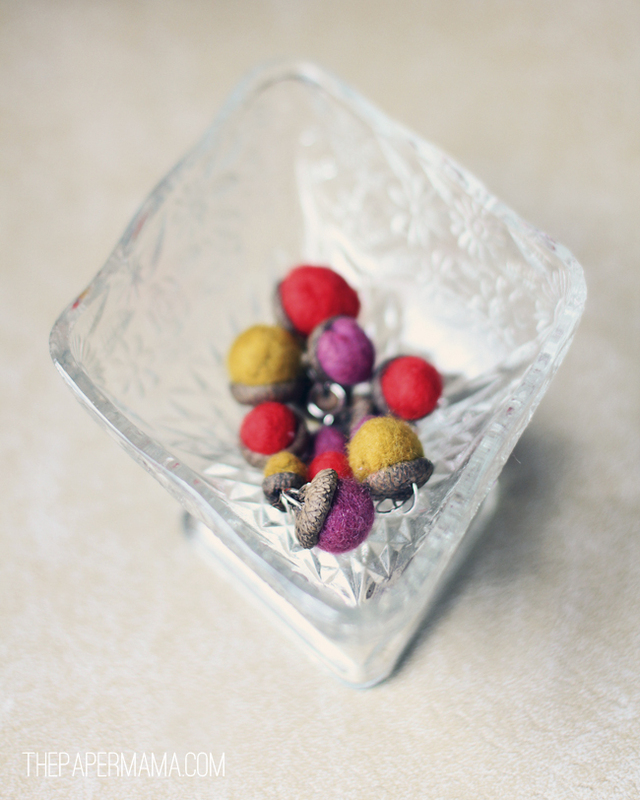 Felted Wool Acorn Necklace: Well, I know today is ACTUALLY Valentine’s Day… but I really wanted to share these little necklaces that my kiddo and I made (well, mostly me). It all started on a walk. While on our daily walk, we found a tree that had dropped a ton of acorns, so we gathered a the tops and headed to the yarn shop. We bought some colorful wool roving and started felting some pieces to create little faux acorns. I did this project with my kiddo, and it was SO messy. Water EVERYwhere. It was actually worth all the water splashing since she had so much fun. She worked on one piece the entire time, and called it her “purple cookie”. It was just a flat 2 inch piece of purple wool. She did a great job and uses it as a blanket for her ponies. I made all the acorn bits. R really wanted to give a necklace to a couple of her friends, so we decided to turn these guys into little Valentine’s goodies. 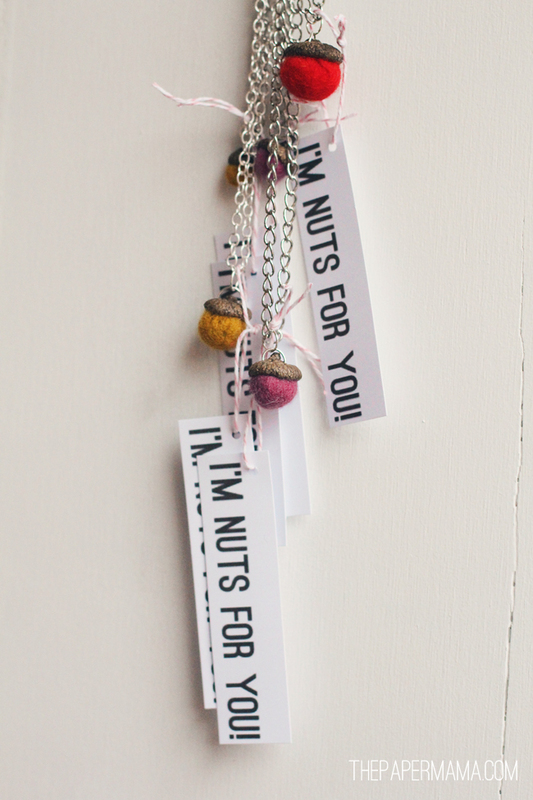 I made and printed out some, “I’m nuts for you!” tags, cut them and and tied them onto the necklaces. That’s it! 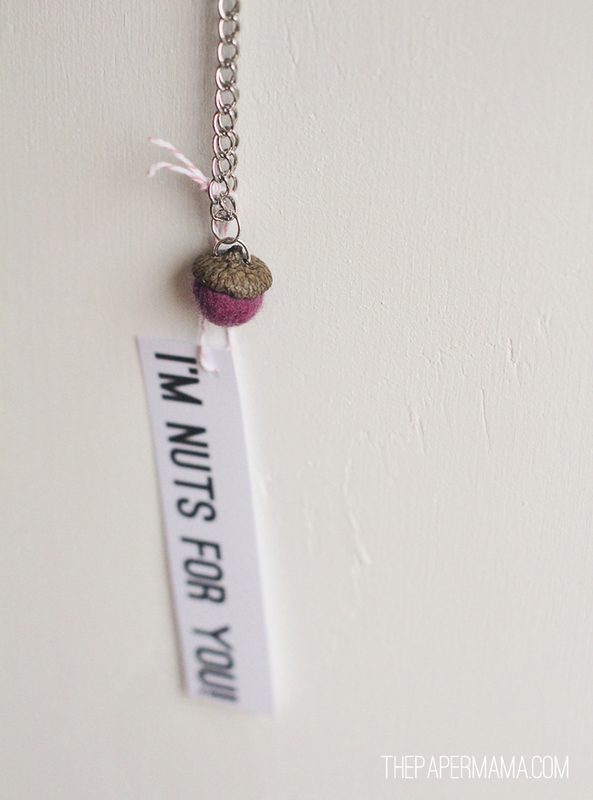 If you want to make this for a special someone (mother’s day is coming up in a couple months) here’s a link to the Felt Acorns Directions I used, from Honestly WTF. 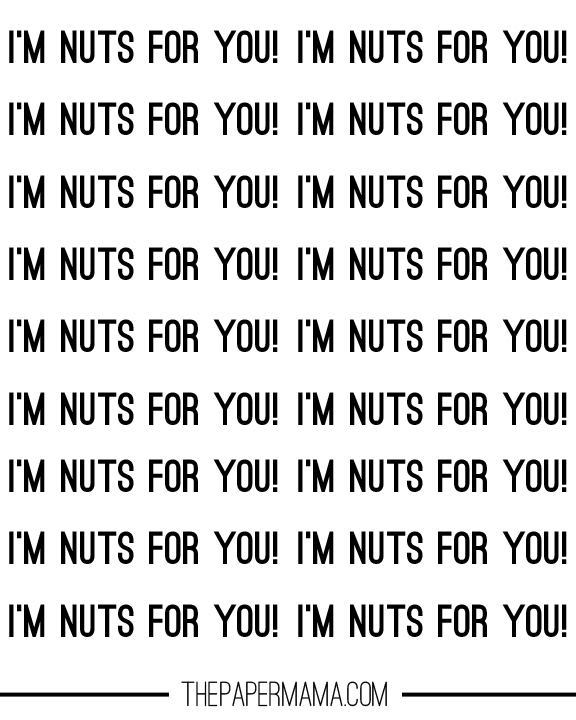 Check out my “I’m nuts for you” printable, and add some necklace chain. Ta dah! P. dot. S. You will get pruney fingers. Bleh. Pruney fingers are like someone scratching a chalkboard for me… I can’t handle it. OMG. Eww. After about 5 minutes of playing in the water, I had to go grab some rubber gloves. Gah. Ewww. Pruney toes and fingers are the worst. Also see: I’m a weirdo.